Along with the Banh Mi and the Monte Cristo, the Po’boy is among my favorite sandwiches of all time. Although they can be filled with anything from sausages to roast beef, I’m a fan of the ones with fried seafood such as oysters, catfish or shrimp. 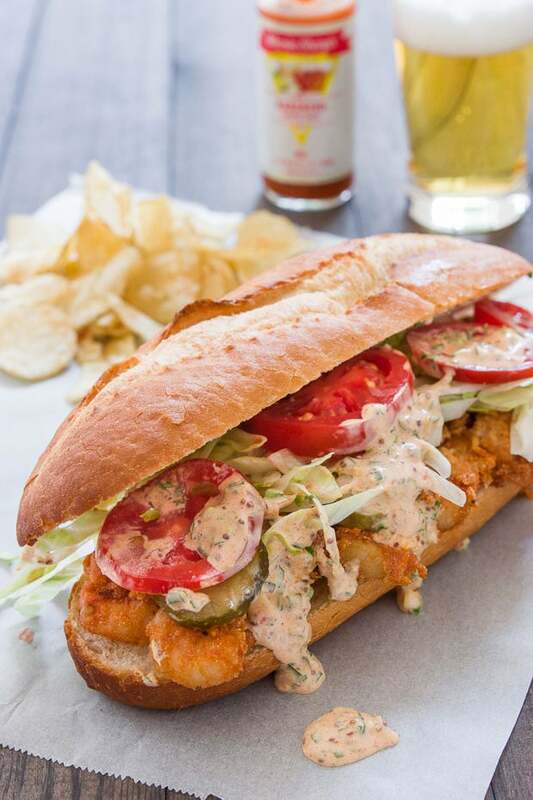 “Dressed” with iceberg lettuce, tomatoes, pickles and a generous slathering of remoulade, Po’ Boys are like a festival of crispy, crunchy, creamy, savory and tangy textures and tastes that keep your mouth coming back for another bite. 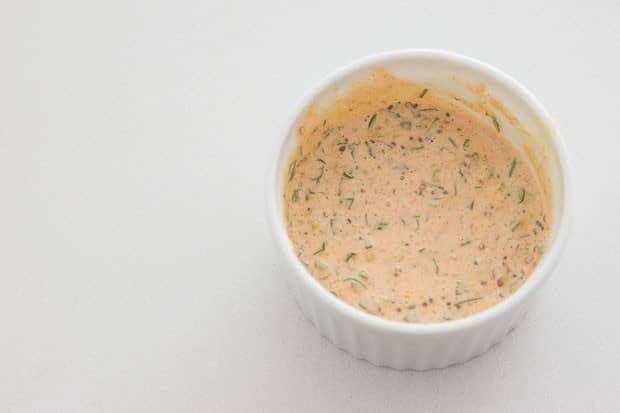 For my Po’ Boy, I like to use smoked paprika both in the seasoning for the shrimp and in the remoulade. This gives the sandwich a marvelous earthy flavor which is the perfect counterpoint to the briny shrimp. 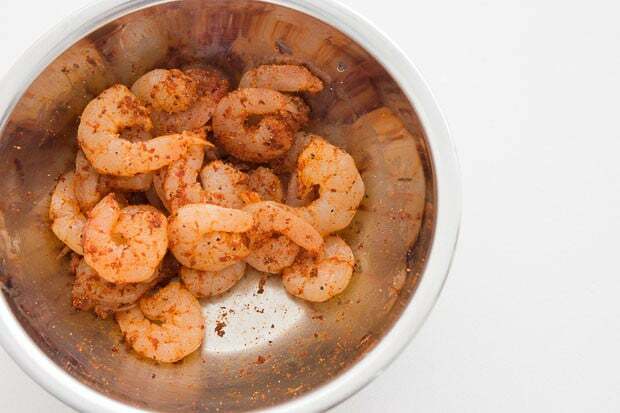 To ensure that each morsel of shrimp is well seasoned, I like to sprinkle the seasoning directly onto them before tossing them in a mixture of cornmeal and flour. This forms a thin crisp shell around each shrimp, with the unmistakable crunch of the granules of cornmeal. Although I prefer my coating thin, if you want your shrimp to have an extra thick coating, first dust the shrimp in flour, then dip them in a beaten egg before dredging them in cornmeal. 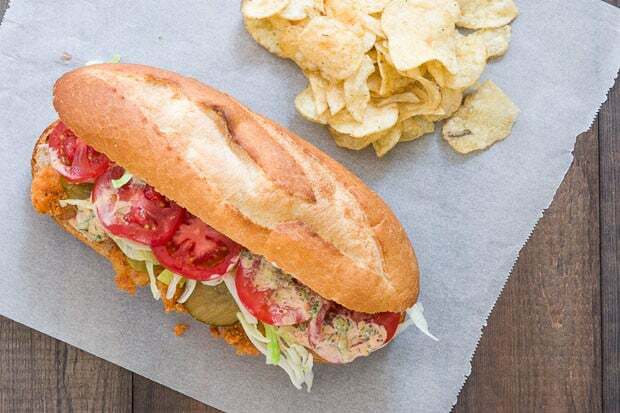 Crunchy savory shrimp with a creamy, tart and smoky remoulade, crisp iceberg lettuce, sweet tomatoes and tart crunchy dill pickles all nestled between two halves of plush french bread with a crisp crust, the finished sandwich is a masterpiece of color, texture, flavor and aromas. 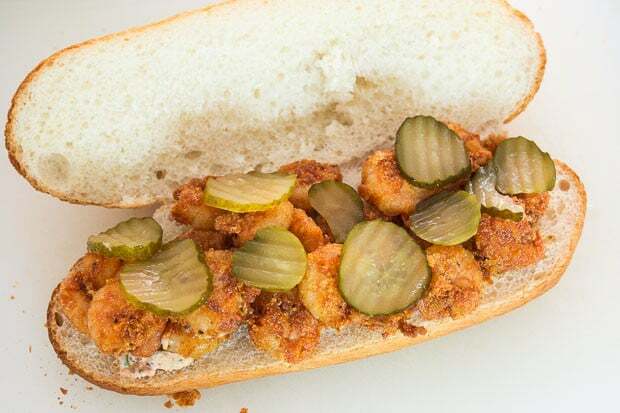 To stay true to the po boy’s humble origins there are a few ingredient preferences I have. The first is that I use small shrimp for this recipe. Not only are small shrimp less expensive, they also have more surface area than large shrimp giving you a better coating to shrimp ratio. The second thing is the bread. Ideally you’d get a loaf from Leidenheimer Baking Company, but since they’re not available everywhere, look for cheap french bread. Cheaper bread tends to have a thinner crisp crust and soft interior, making it perfect for this sandwich.